← What is Your Body Saying??? We live in an increasingly toxic world, one in which our exposure to harmful toxins has become unavoidable. According to the EPA, in 2005 there were over 650 toxic chemicals released into the environment via air, groundwater, soil or water table. These chemical toxins enter our bodies through pollutants in the air, pesticides on our food, contaminated water, dry-cleaning chemicals, household chemicals and so on. Ideally, it would be great to avoid all chemical pollutants, however this is NOT realistic. So it becomes OUR responsibility for our own health and well-being. The first step toward optimal health is regular internal cleansing and detoxification to address the toxins to which we are continually exposed. Toxins are substances that cause harm to the body’s cells and organs and inhibit their everyday functions. Natural medicine recognizes seven basic channels of elimination, which are directly involved in eliminating toxins from the body. •	Liver – detoxifies toxins in to substances that can be safely eliminated from the body. •	Lungs – expels toxins by exhalation and trap toxins in mucus. •	Lymphatic system – eliminates toxins from cells through a network of vessels that extend throughout the body. •	Kidneys – filter the blood, removing and excreting water-soluble toxins through the urine. •	Skin – excretes toxic substances through perspiration. •	Blood – flows through vascular system and carries oxygen and nutrients to the cells of the body while removing harmful waste. •	Bowel – eliminates toxins and waste from the liver and the digestive system. Detoxification refers to the body’s natural process of disassembling and eliminating toxins from the cells, organs and the bloodstream. Cleansing is the act of elimination of toxins, stored wastes and other unwanted substances from the body. 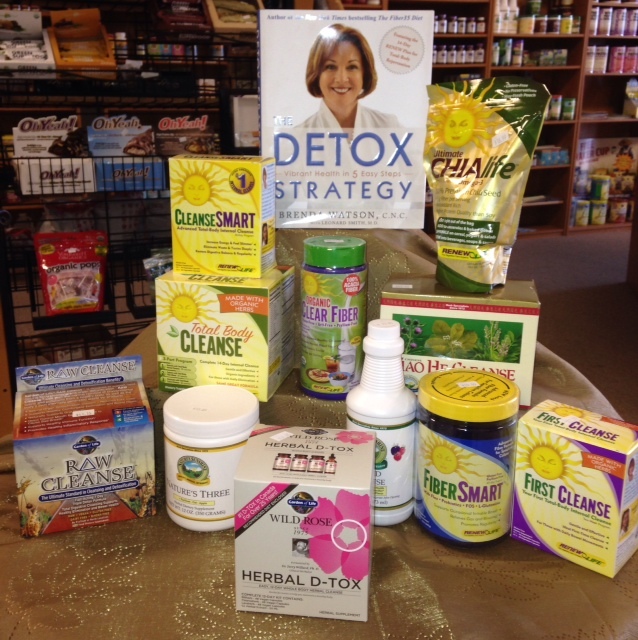 This month’s special is 15% off all cleanses—buy a second product, fiber or probiotic and get Brenda Watson’s book, “The Detox Strategy” for free!